I have the center of my Fading Charms quilt together, and am about to audition it for background fabric. I have modified the Fading Charms quilt to become a crib sized quilt made from pieces approximately 1 1/4 inches approximately square. For three years I got boxes of samples of fabric available from Keepsake in NH. I always felt they should be used for something. Plan A had been to use them as leaders and enders and make four-patch blocks that could become cornerstones when sashing a scrappy quilt. But then I saw the Fading Charm tutorial and decided to make it without having to cut. Because the pieces are not exact, I threw out what few perfectionist tendencies I still have. 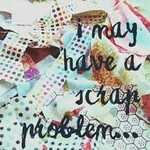 Nor did I count how many pieces I have. If there are not enough, I’ll figure something out then. I might even cut some. I am debating between sunshine yellow and lime green “the new neutral” for the background. Dark looks good, but this is for a child; white looks good, but this could end up being washed in a river–it will go to Sunshine (see link to the side). And I am deep into sock making. I have to keep several pair going in various stages so that one is always ready to take to knitting group meetings. The bottleneck is turning the heel. I like to do that step when I am not also trying to carry on a conversation. 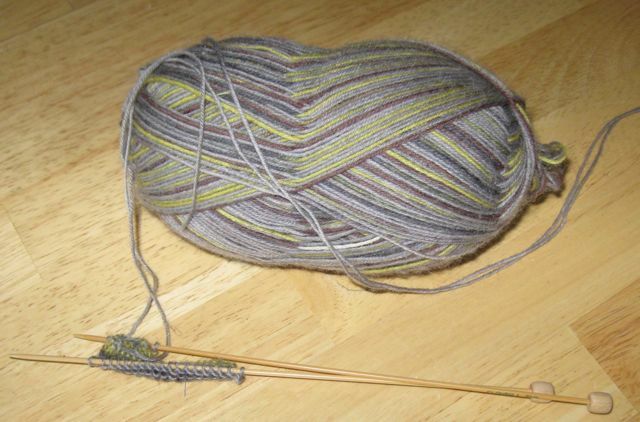 The gray-yellow yarn is mystery yarn–no label. I’ll have to test whether it is wool or not. 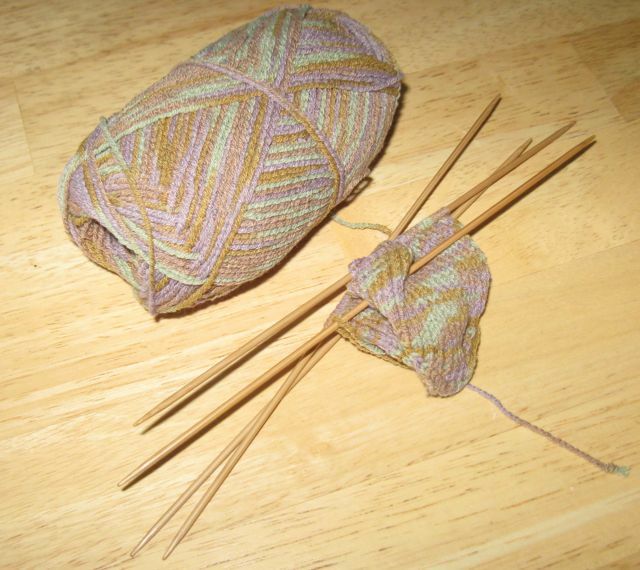 The gold-green-lavender for the toe-up sock is made from corn. 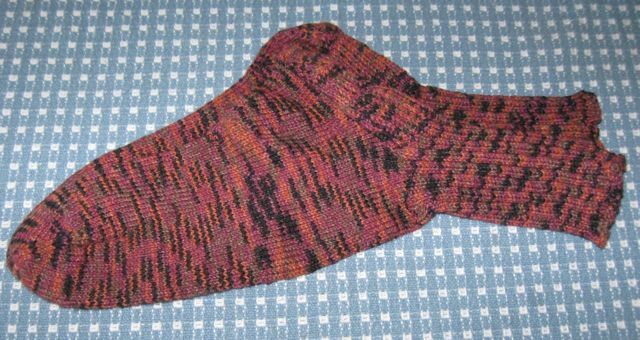 This finished toe-up black-brown pair took three tries. 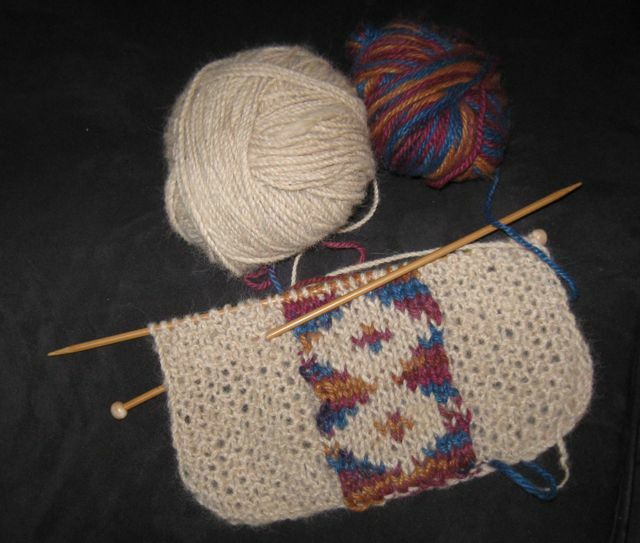 I did a swatch, followed directions, and realized they were turning out way too big. So I started over, but I didn’t shrink them enough, and had to start over yet again. Getting my money’s worth out of my yarn again. It feels good to have them finished; plus they are cotton, and the season is right. This pair of socks has been demanding my attention. Last started, and probably next finished. I finally got a yarn scale so that I could estimate how much yarn I have left over, and I have these three that go together rather well. The red to the left is back up in case I run out of the other two, but I don’t think I will. Self patterning yarns make one want to do one more color, one more, one more…and since it is so long since I had used this ball of bright yarn, it is as if it were the first time. Plus there is the question of how it will look in combination to push me on. 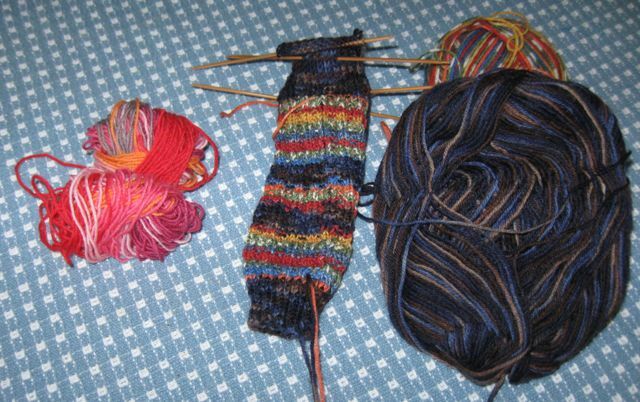 I plan to do the heel in the dark blue multi, then do the second sock up to the same point, and then evaluate how much yarn is left and plan from there. 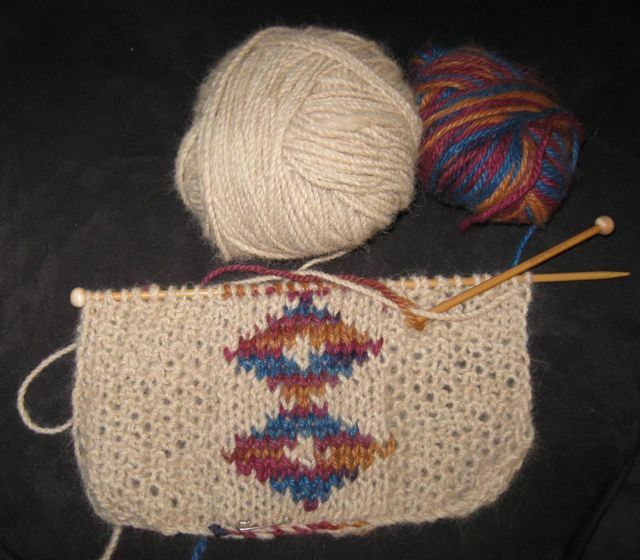 Then there is my “thinking” project for home and alone: a scarf in reversible Fair Isle center with seed stitch sides. It is made with nice alpaca yarn. Soft, soft, soft. 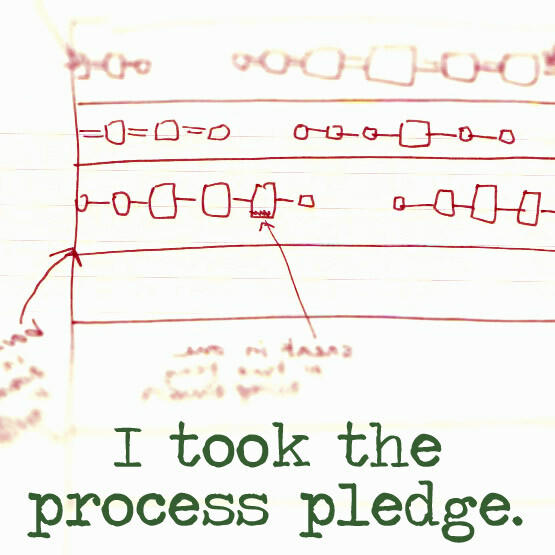 I think it is good that I have an infinite tolerance for unfinished projects. Blocks 1-1/4 inches are really small and difficult to work with – congratulations. 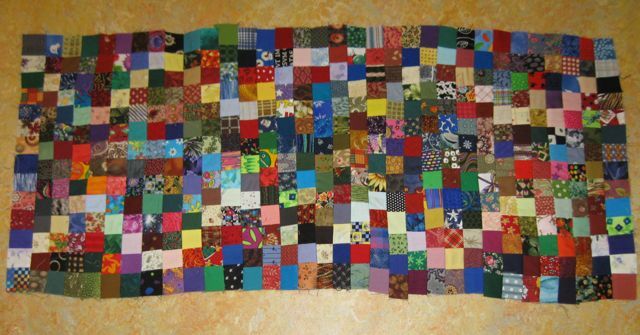 The center looks great and you were able to use up some fabric you had on hand. Also admire the knitting, although I don’t knit myself.